Bobby Moore was the embodiment of all that was great about English football. Captaining England to glory in 1966 and West Ham to victory in several major tournaments, he was loved and respected throughout the world as football’s golden boy. This definitive and authorised biography illuminates the extraordinary story of a sporting hero, from exciting accounts of his World Cup triumph to candid memories of his friendships with Beckenbauer, Eusébio and Pelé. It also reveals the inside story of a life beyond football, updated to include fascinating new material on Moore’s enduring legacy in the years following his tragically premature death. Award-winning sports writer Jeff Powell, a close friend and confidant to the Moore family, has created a powerful and fitting tribute, honouring the golden era of English football and the exceptional man at its helm. A worthy testament to a fine man and a simply marvellous footballer. It is Powell’s lucid picture of Moore the footballer … which makes the most indelible impression … An admirable portrait. 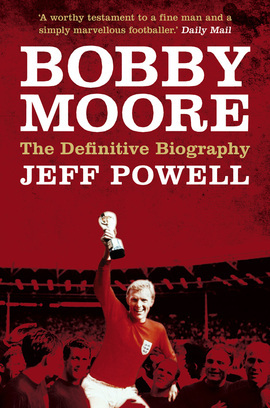 This is a new edition of the heartfelt, insightful portrait of the 1966 World Cup-winning captain by one of our greatest sportswriters… Powell’s book delicately probes Moore’s personal life as well as documenting his many sporting triumphs. [A]n essential read for anyone interested in the life and times of English football’s greatest captain and is worth the price for that alone. It is fond and sometimes sentimental … As well as joy and dignity and finest hours … the story also includes business failures, a broken marriage and a decline … Powell does not gloss over any of it.